Lenzie Academy’s under-16s are through to the semi-finals of the National School Bowl after a dramatic 22-21 win over Lathallan School. 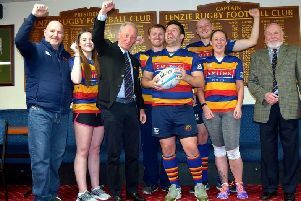 Due to frost the match was switched from Viewfield to the Astro pitch at Burnbrae - and although Lenzie started well it was the visitors from Angus who opened the scoring with a good individual try which was easily converted. Lathallan gained confidence from this score and as their forwards began to dominate possession they scored again to take a 14-0 lead. The home side took the game back to the visitors and Brandon Lennox was unlucky to be stopped near the try line. But the ball was recycled quickly and Gavin Cruickshanks switched the play to allow Connor Allen to release Calum McCaffery who scored an excellent, unconverted, try in the corner. However Lathallan forced a mistake from the home side and scored again to make the score 21-5 at half-time. Lenzie upped their game in the second period and narrowed the gap when Jack Walmsley powered over from close range for a converted try. The game was now turning in Lenzie’s favour and from a quickly taken penalty Cruickshanks went over in the corner for an unconverted try which cut Lathallan’s lead to 21-17 with 10 minutes to go. And straight from the restart Hamish Taylor made a telling break and released Philip Carvalho who raced in from 60 metres to put Lenzie in front for the first time in the game. Lathallan came back strongly and put the home side under tremendous pressure in the last five minutes but strong defence kept them out and secured a semi-final against Caithness at Viewfield.